What is Drying, Threshing and Cleaning? Late summer/early fall is the perfect time to collect seeds. To help ensure the success of your seeds blooming, we've offered tips on seed collecting in this issue. Use your greenhouse to grow fresh cold weather crops that include both vegetables and flowers. Once you've decided to collect seeds, you'll want to ensure that you take careful steps to keep your seeds healthy. This is a fun project that all family members can enjoy, and it's not limited to your own backyard! The best time to collect seeds is about one month after they are done flowering. While plants mature at different stages, the majority of seeds are ideal to collect in late summer and early fall. Always collect seeds in paper bags or envelopes. I like using envelopes for the simple reason that it is easy to mark the name of the seed on each individual envelope. So, make sure you have plenty of envelopes and a good waterproof marker before you set out for an afternoon of seed collecting. Avoid plastic as the plastic can retain moisture that can lead to fungus and mold on the seeds. It's best to collect on dry days, and afternoons are better than morning as all dew will be dried off plants. Remember to collect only ripe seeds. How do you know if a seed is ripe? Ripe seeds are hard and dry and should easily drop off from the plant. Unripe seeds are soft and fleshy and should be left behind in tact on the plant and collected at a later date. Plants with seed clusters, such as daisies, are best picked by cutting off the entire top of the stalk. You can then plant them direct into your garden by dispersing the seeds by wind, or you can store them in a paper envelope. You'll want to make sure you get these seeds before they blow away on their own though! Some seeds develop in pods that will explode when they are ready to release the seeds. This happened to me with pods I had taken from large Wisteria vine. They exploded across my kitchen one day in early spring. I collected them off of the kitchen floor, planted them out in the greenhouse, and had several new wisteria vines growing very quickly. As I learned, it is best to keep pods in small box covered with either mesh or holes poked through it. The pods will need air for ventilation, but when they explode, the seeds will be contained to the box. You must complete three very important steps before you store seeds for winter months. These three steps are drying, threshing and cleaning. Drying seeds must take place as soon as possible to remove any moisture. This will decrease or prevent fungus or mold growth during storage. The easiest way to dry seeds is to place them on a screen in the sun, or inside any warm well ventilated area. Threshing refers to the removal of any plant growth or material that may surround the seed. You may have to rub the seeds against a screen to remove this plant material. The final step is cleaning the seeds. The cleaner the seeds, the better they will grow when planted. Clean the seeds by sifting them through smaller and smaller screens, separating the chaff from the seeds. Care should also be given as to where the seeds will be stored. You'll want to store seeds in a cool, dry environment away from rodents or insects. A spot in the basement usually works well. You may find that many seeds will require some care to begin germination. This is because the seeds have shut down, or become dormant, during the winter months. You'll want to let the seeds know that it's okay to "come back to life". The best way to do this is to let the seeds absorb moisture. You can place damp sand mixed with the seed in the refrigerator. Or, you can keep the seed wedged between two sheets of paper towels (ensure that the paper towels are kept moist and not wet). Some seeds should be scratched to aid in faster germination. The paper towel test is a good way to test the germination rate of your seeds as well. Why not try your hand at seed collecting. It's a fun hobby and you can start many of your own annuals and perennials right into the greenhouse or the garden. September is the perfect time to thoroughly clean the greenhouse and prepare it for the winter months. You will want to decide what you want to bring into the greenhouse from your garden. I also store many of my tropical container plants into the greenhouse for the winter. Make sure your plants are insect free before bringing them into the greenhouse. 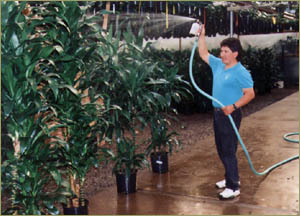 Hose the leaves down and let the water run through the soil for a good five minutes, flushing any insects out of the container. For infested plants, after flushing the soil, spray the plant with an organic insecticide and enclose the entire plant in a plastic bag for about 3 days. This should rid the plant of any pests it may have been carrying. If you want to serve your own vegetables for thanksgiving, now is the time to plant carrots, cucumbers or cauliflower. Or how about growing some fresh flowers for your centerpiece? Do a little research and see what you can provide for Christmas dinner. Your guests are sure to be impressed with home grown veggies during December! You can keep your heating costs to a minimum by growing cool weather crops. Want a fresh salad? Try the many crops from the lettuce family that include French Sorrell, Swiss Chard, Radishes, Carrots, Onions, Broccoli and Chives. Rosemary, Fennel, Dill and Cilantro will complement many meals. Pansies and snapdragons are very cold hardy flowers, surviving down to about 25 degrees F. You'll want to plant before the cold weather sets in. Plant carrots, cauliflower, lettuce or broccoli in the greenhouse about one month before the first frost and well after the hot weather. Otherwise, you risk a poor crop yield. 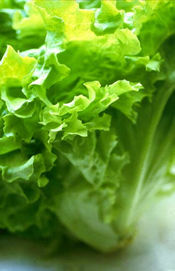 Get more out of your lettuce crops by cutting the lettuce leaves off after a good growth and before maturity. This may yield three crops instead of one. Growing cold weather crops is easy and will allow you to have fresh salads, flowers and vegetables all winter long.